Are you looking for a delicious cheese recipe with a difference? If you are, you’ve found it! Here’s my french beans with sun-dried tomatoes, feta and mozzarella for you to enjoy. This recipe (like most of my recipes) happened by accident. I was hosting a barbecue party and a friend of mine challenged me to make something that resembled the colours of the Italian flag. I went to the fridge, got hold of everything green, white and red and came up with this masterpiece. Today, it has become one of my signature dishes among my friends and we still enjoy it at every barbecue party. Make sure that the French beans are not overcooked and use a good-quality buffalo Mozzarella. 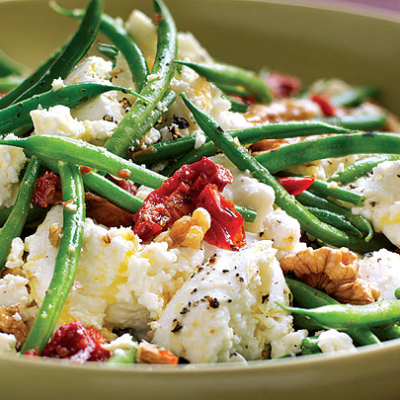 Feast your eyes on the finest french beans with sun-dried tomatoes, feta and mozzarella! It’s straightforward and fun to make this great dish. Simply follow the instructions below and get the perfect result. Trim 1⁄2cm from both ends of the beans, then cook in a large pan of boiling salted water for about 5 minutes until al dente. Drain well and place in a large bowl. Lightly toss the hot beans with the sun-dried tomatoes, walnuts, extra virgin olive oil and lemon juice. Season with salt and pepper and leave to cool. Once the beans have cooled, crumble in the feta and gently mix in the Mozzarella. Serve immediately. 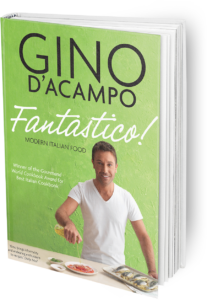 Once you’re done, simply sit back and enjoy your french beans with sun-dried tomatoes, feta and mozzarella and don’t forget to check out other great authentic Italian recipes including great antipasti recipes, Italian pasta recipes, Italian soup recipes, Italian beef dishes and authentic pizza recipes.